Sims Metal Managements shares declined on news that it has overstated the carrying value of its UK inventory, mainly for its Recycling Solutions business. The adjustment could be around $60 million. It relates to changes in the assessment of the net realizable value of some stock and to book to physical adjustments. Preliminary findings indicate it may be due to control failures and potentially fraudulent conduct by local and regional plant management responsible for technology and downstream processing systems. A board committee has taken responsibility for the investigation now underway. Their immediate priority is to determine the amount of the adjustment and the impact on the accounts. The Australian Energy Regulator has accepted Infigen Energys application for electricity retailer authorization. Infigen intends to expand its business through subsidiary Infigen Energy Holdings (IEH) to retail electricity for large customers only. Clean TeQ Holdings has made commercial progress in both its Air Division and coal seam waste water treatment subsidiary. The Air Division is currently delivering the greatest number of projects in the companys history across mostly municipal clients for air quality management. The projects are in most States around Australia, and include compact turnkey BioFilters for local pump stations and large BioTrickling Filters to control the air emissions from large wastewater treatment plants. The largest projects are valued over $2 million and all use Clean TeQs OdourTeQR biological air treatment technologies. Clean TeQ said that given the number of plants in construction, it is clearly the market leader for odour control in the Australian marketplace. The Divisions increase in number and size of projects has created a demand for additional working capital, as most payments are made on the completion of operational milestones. The company is entering into short term debt funding facilities. Clean TeQs 50:50 water treatment joint venture with Nippon Gas Co, Associated Water Pty Ltd, recently completed the construction of its demonstration facility at the Wambo feedlot, near Dalby, Queensland. The plant removes the salt from coal seam gas (CSG) water, making it suitable for livestock and irrigation. The plant is treating CSG water from one of the gas suppliers in the area. Early results are in line with the expectations that the plant will provide the required level of water quality for beneficial use by the landholder. Clean TeQ said numerous interested parties from the gas companies, engineering consultancies, delivery businesses, and regulatory bodies have visited the site to see how the technology can meet the environmental and economic needs for treating CSG water. The CIF technology recovers 90 to 95 per cent of the water, which minimizes by product streams. Many of the by product salts can be used in agriculture, it said. The current outcome is being achieved with the operation of only Clean TeQs CIF technology with no requirement for microfiltration, ultrafiltration or reverse osmosis. The CIF technology is low energy and can be powered by solar or other renewable energy, a major advantage for remote locations. Once the demonstration of CIF for this application and the verification of the economics are finalized we expect to see it become the technology of choice for many within the industry, said executive chairman, Greg Toll. AFT Corporations consolidated group revenue for the 12 months to 31 December 2012 was $6.2 million. This is down on the original budget of $10 million. Chief executive, Stone Wang, said the result was achieved in an environment of falling prices and reduction of government support for the solar industry. As part of the companys plan to rebuild solar revenues it has entered agreements with two regionally based solar installers in NSW who will partner with AFT Corporations subsidiary, Artemis Building Systems Pty Ltd, to provide commercial solar installations that can be lease financed. The company plans to partner with a further eight solar installers across Australia in 2013, he said. (ASX: AFT). Shares in Australian Renewable Fuels touched a new three year low of 0.8 cents on 24 January. Managing director Kieran Rodgers has acquired 3,125,000 shares at 0.8 cents each. Mr Rodgers has become a substantial shareholder with 5.9 per cent. Orbital Corporation has won an additional contract to supply heavy fuel engines for Small Unmanned Aircraft System (SUAS). The latest order will take the total revenue for SUAS engines and spare parts to over $10 million for the current financial year. Vmoto has appointed a new distributor for The Netherlands and said that production and delivery of electric scooters for PowerEagle in China is ahead of schedule. Vmoto produced about 7,000 scooters for PowerEagle in 2012 and at 31 December had delivered 6,300 units. It put on double shifts to ensure production targets. It also installed new assembly lines on the manufacturing floor of its Stage 2 Manufacturing Facility as larger space and more assembly lines are needed to meet increasing production, with 42,000 scooters predicted in 2013. The company continues to produce its E Max series electric scooters in its Stage 1 Manufacturing Facility and forecast production is unchanged. Manufacture of the E Tropolis electric scooters is on course to commence by the end of March 2013. The company expects its financial performance for the six months to 31 December will be in line with market expectations. The new exclusive distributor for The Netherlands is B.V Nimag, which also import Suzuki cars, motorcycles and marine vehicles plus sports cars and began distributing electric scooters in 2011. B.V Nimag markets its electric scooters business as Nimoto and branded electric scooters from Vmoto as Nimoto Pro Powered by Emax. Dart Energy said a three month production test of Airth 12 in Scotland was successful and produced continuously with sustained gas flow rates of over 500,000 standard cubic feet per day (scf/d) of gas and peak flow rates exceeding 800,000 scf/d. The test confirms the wells production potential of 1 million scf/d, validating long term project economics. Pending further field development including the installation of compression facilities, Dart intends to continue to flow gas from the well for on site electricity generation at the capacity of the local grid which is about 100,000 scf/d. Dart Energy International chief executive, John McGoldrick, said We have invested significant capital in this area and are proud to be the first company to generate electricity from coal bed methane (CBM) natural gas in Scotland. During our Airth 12 well production test we have achieved sustainable and continuous flow rates significantly higher than any other CBM well production in Europe. East China Mineral Exploration & Development Bureau (ECE) has withdrawn from its proposed investment in Galaxy Resources that was announced on 5 November 2012. Galaxy said ECE has indicated it is willing to re consider the investment when Galaxys Jiangsu Lithium Carbonate Plant in China returns to stable operation. Advanced Engine Components has entered a conditional Term Sheet for a proposed acquisition in the alternative fuels market and a recapitalization of itself. The company said the acquisition will enable it to expand its existing China business by incorporating the vendors heavy duty LNG dual fuel engine conversion technology, and in Australia to supply, install and operate micro LNG plants at low volume stranded gas production fields. Subject to due diligence and shareholder approval, the acquisition will be funded through the issue of 261.63 million shares and $250,000 cash. The vendors will have two board seats. 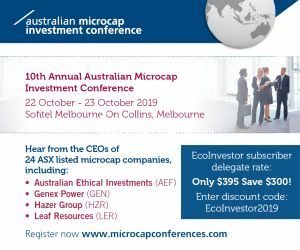 The vendors will arrange a capital raising of $2.33 million through the issue of 116.28 million ACE shares, to be undertaken in two tranches. An initial placement of 29 million shares to raise $580,000 must be fully committed within four weeks from signing the Term Sheet. A further placement of 87.28 million shares to raise $1.75 million will be completed following shareholder approval of the recapitalization. The placement funds will mainly be used for working capital and to settle third party creditors. AnaeCo and Brisanzia Technologies Pvt Ltd of New Delhi have signed a Memorandum of Understanding to explore the implementation of AnaeCos DiCOM Alternative Waste Technology (AWT) at a suitable site in India. The parties will consider the technical and commercial feasibility of deploying the DiCOM solution under licence in India. AnaeCo would manage the design and commissioning of the facility and Brisanzia would have project management, construction, operations and maintenance responsibilities. Eden Energy received a query from the ASX when its shares doubled from 1.2 to 2.5 cents in one day, and on high volume. Geodynamics has produced an excellent presentation on how its 1MWe geothermal power plant will work. The presentation, by mechanical engineer, Ben Humphreys, covers all of the key parts of the plant, both steam and electrical, and these are explained in an easy to understand way. It also discusses the key performance parameters for plant operation. Shares in KUTh Energy leapt from 2 to 3.1 cents on news that it has received a Production Licence for geothermal development on the main island of Efate from the Vanuatu Government. The licence has a 30 year term and is to exclusively develop and commercialize the geothermal energy in the license area. The minimum tariff is 23.9 vatu/ KWh or about 25 cents, and is CPI adjusted each year. KUTh also has the right to earn carbon credits from the project. KUT said that on completion of the power purchase agreement (PPA) with the utility, UNELCO, it is committed to a program of exploration and development that will lead to the commencement of construction of a geothermal power plant within 36 months of the signing of the PPA. The company will need to finalize terms with landowners once the resource has been delineated and the location of production drilling and power plant construction is identified. In the interim, it will agree terms with landowners for exploration drilling with options for long term lease if successful. The Louisiana Economic Development has announced plans for the development of a US$2.2 billion LNG export facility at the Port of Lake Charles, Louisiana, by Magnolia LNG LLC, a US subsidiary of Liquefied Natural Gas. The announcement of the US$2.2 billion LNG export facility plans follows the Companys announcement on 19 December that the company had secured a position in the US LNG market.